San Luis Obispo County, (October 6, 2016)â€”Stroll golden vineyards with a glass of world-class wine, experience the enchanting flutter of Monarch butterflies taking flight or break away from the herd at a public art exhibit featuring dozens of hand-painted cows. Thatâ€™s right: Fall fun is in full effect in San Luis Obispo (SLO) County, conveniently located midway between Los Angeles and San Francisco on Californiaâ€™s Central Coast. Elsewhere, the weather may be turning gray and chilly, but in SLO County, the sunâ€”and funâ€”are still shining strong. Explore these coastal, cultural and artisanal offerings rolling on all season long and plan your unforgettable fall adventure today. Experience the excitement that touches every aspect of harvest in Paso Robles Wine Country, including picking, crush and bottling processes at work. During Harvest Wine Weekend (Oct. 14-16), raise a toast to the new vintage with wine-centric events overflowing at more than 200 wineries nestled within oak-studded terrain. The sipping and swirling doesnâ€™t stop there. Live music, educational classes, winemaker dinners, tours, a grand tasting, auction, and even more behind-the-scenes harvest activities will uncork during SLO Wine Countryâ€™s anticipated Harvest on the Coast (Nov. 4-6), which encompasses wineries from Edna Valley and Arroyo Grande Valley to the sands of Pismo Beach. Craft beer nuts will rejoice during SLO Beer Week (Oct. 16-22), which features dozens of local and Golden state beers poured at tastings, dinners and tap takeovers hosted by local restaurants and breweries. Whether you like â€˜em hoppy, sour or dark, you wonâ€™t want to miss opportunities to meet the brewers and learn how your favorite flavors are fermented. We guaranteeâ€”youâ€™ve never seen anything like it! Thanks to the public art exhibit Cow Parade (Oct. 1 â€“ May 2017) dozens of life-sized, hand-painted cows have taken over SLO County with whimsy, attitude and sass to spare. Follow an interactive Cow Trail Map and traverse historic landmarks like the Madonna Inn or stop by local restaurants, galleries and street corners in search of â€œmini moosâ€ and bovine excitement. While youâ€™re out and about, be sure to keep an eye peeled for the annual Cambria Scarecrow Festival (Oct. 1-31), which dots the coastal Highway 1 hamlet with inventive scarecrows dressed to the nines. Hint: youâ€™ll spot the fun photo ops in store windows, wine tasting rooms and art galleries galore, so stroll with a camera handy. Get intimate with local artists and enter private homes, studios and workspaces across the region during Open Studios Art Tour (Oct. 15-16). Create your own self-guided route and plan an afternoon filled with sculpture, paintings, glasswork, jewelry and new artistic friends. Surfâ€™s up at the Surfboard Art Festival (Oct. 1- Dec 3.) in Morro Bay, where 20 artists will showcase their talent in this amazing art exhibition. Marvel at thousands of black-and-orange Monarch butterflies as they make their fall migration to temperate Pismo Beach, one of Californiaâ€™s last quintessential beach towns. This yearâ€™s epic butterfly season begins with the Monarch Grove Grand Opening Celebration (Oct. 22), featuring family-friendly activities, interesting booths and close encounters with thousands of winged wonders. The kiddies will gasp and the grown-ups will giggle at Zoo Boo at Charles Paddock Zoo in Atascadero (Oct. 29). The costumed shindig mixes wild animalsâ€”including a Malayan Tiger, Two-Toed Sloth and Gila Monsterâ€”with carnival games, a haunted house and activities suited for every age. Thereâ€™s just too much fun to pack into one place, including additional wine excursions, film screenings, pumpkin carving contests, community parades and Halloween treats. 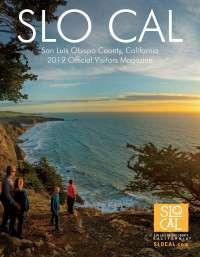 Check out our up-to-date blog for more autumnal allure in San Luis Obispo County or go to www.VisitSanLuisObispoCounty.com for more information and to book your stay.